Fred makes these fun little pull toy shakers, for when you don’t feel like shaking it yourself, or just to add a little life to your table/meal/etc. This could be great for powdered sugar actually, to get that perfectly snowy look on your french toast. Check them out at Calliope. 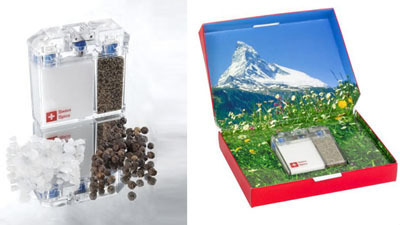 “The Swiss Spice Company is a young and dynamic firm that is internationally active. 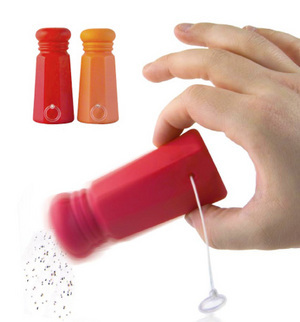 The manufacture under the label “Made in Switzerland” and the marketing of quality products lie at the core of our business.” This great little salt and pepper shaker is ideal for on-the-go spicing - 6 x 6 cm and 1.7 cm thick. It is robust and even humidity proof. From the country that brought you the swiss army knife, they claim that this was designed with the same amount of thought and precision, and what is most interesting is that it is not only made solely in Switzerland but it utilizes sustainable production - via the Job Factory [an interesting description of how this project helps to give jobs to youth who have trouble finding apprenticeships/etc and have had a rough life]. Also brandable as schwag! Beer label art? This is making reference to the tendency for people to pick at the labels on their beers when nervous. I personally think this is just a great way of always having origami paper handy. No more floppy cranes from napkins. 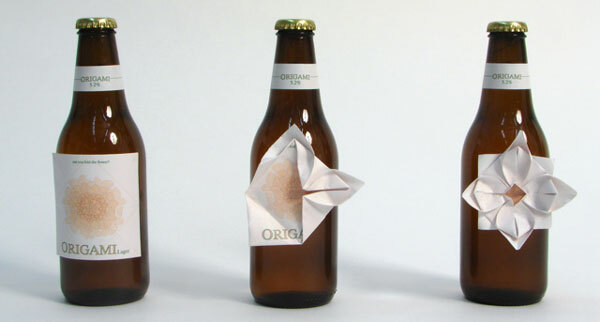 I would love to see some crazy unit origami work with this somehow integrating the bottles instead of just a basic flower fold, but maybe that’s for when you graduate to the hard liquor. 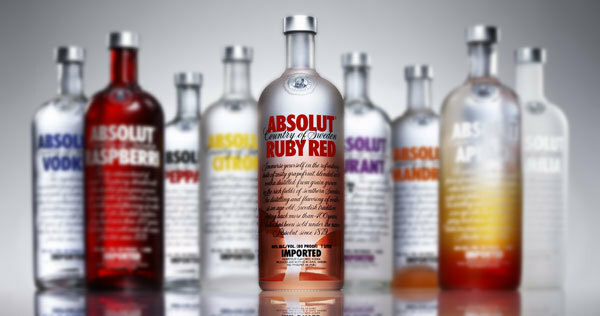 Wow the Absolut family sure has grown - they just announced Absolut Ruby Red a few days ago in NY, and it sohuld be available around June. On a more designer note - they always manage to have such incredible graphics - their current Absolut.com interface remines me a lot of Apple’s Front Row and their web slideshows (slick rotation/nice mirrored floor? painfully beautifully clean?) Their music campaign with 11 artists’ tracks and videos you can download are slick - as are the downloads for wallpapers in the “Find Your Flavor” section. - but about the Ruby Red and the ever growing family - it should make for a good Greyhound?